I am the first to admit that I have some strange meals; some are simply leftovers, reheated. Others I make fresh, but due to the fact that I have some dietary issues (wheat intolerant) I have to create my very own recipes. Here's one that I make to be either a quick side dish (of vegetables, which sometimes get left by the wayside on a busy job site) or with a bit more liquid, it makes a great soup. When I went to Fraser Valley College, they had a cafeteria which produced the most incredible and much sought after soups. I guess with the courses they offer there, all outdoors type stuff, they need to figure out a great menu for the hard working students. 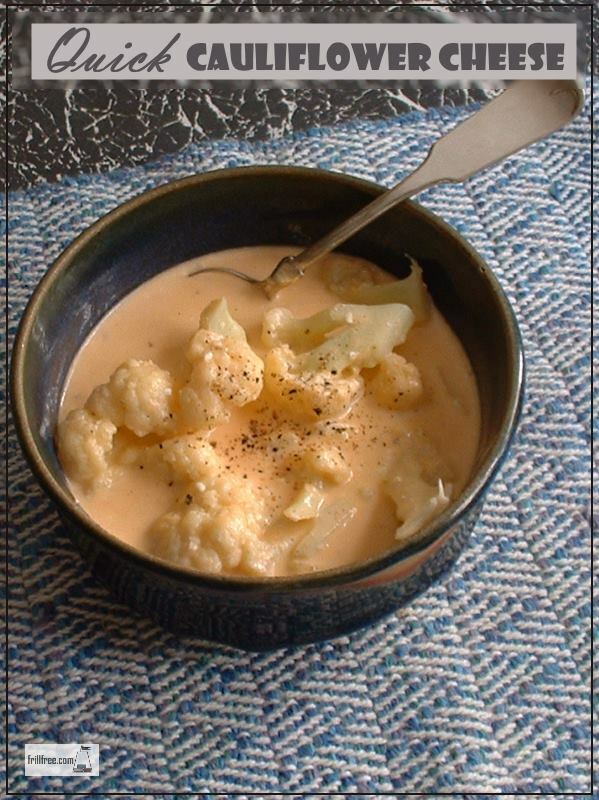 That's carried over to my job sites; one of the recipes that seemed to always be popular was Broccoli Cheese Soup - as the broccoli goes a bit soft when cooked, I started to substitute cauliflower. Then I was diagnosed with wheat intolerance, so I had to find something to use as a thickener other than wheat flour, hence the cream cheese. All this to introduce one of my simple and nourishing meals; Quick Cauliflower Cheese. There are basically four ingredients in this dish, and they should be adjusted to suit your needs and palate. Milk - 2% or Homogenized - nowadays there are so many other non-dairy choices for milk - try Cashew Silk or other nut milk. Cauliflower, cut into bite sized pieces. Microwave for a minute or two longer. Add freshly grated pepper, and my secret ingredient, salad dressing mix for flavor. Enjoy in a blue stoneware bowl, or other kind of special dish.